Neeraj is a Vice President and Officer of GE Company. He joined GE in 1996, and worked his way through GE’s Corporate Financial Services business, holding a number of positions including auditing, underwriting, six sigma, sales and management. He is currently the President & CEO of GE Capital, Commercial Distribution Finance (CDF). CDF is a leading provider of specialized financing products and services that facilitate the manufacture, distribution and sale of consumer durables including: Marine, lawn and garden, motorsports, RVs, trailers, electronics, appliances, and technology products. 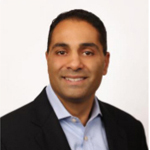 Previously, Neeraj was the President & CEO of the Bank Loan Group (BLG), a lending business, for GE Capital, Americas. As a leading institutional investor, BLG invests in syndicated bank loan facilities and special situations. Neeraj built a similar GE Capital Bank Loan business in Europe. He is a member of Asian Pacific American Forum’s Executive Council for GE. In 2010, Neeraj received the “High Impact Leader” award from Ascend, the National PanAsian network. He is also involved in community leadership roles with United Way, Chamber of Commerce and the Acumen Fund. Neeraj earned his master’s degree in finance and banking from Syracuse University and received his bachelor’s degree in social science from the University of California, Irvine. He and his wife have three children.